Age-related vision loss is common and devastating. But new research suggests that physical activity might protect our eyes as we age. There have been suggestions that exercise might reduce the risk of macular degeneration, which occurs when neurons in the central part of the retina deteriorate. The disease robs millions of older Americans of clear vision. A 2009 study of more than 40,000 middle-aged distance runners, for instance, found that those covering the most miles had the least likelihood of developing the disease. But the study did not compare runners to non-runners, limiting its usefulness. It also did not try to explain how exercise might affect the incidence of an eye disease. So, more recently, researchers at Emory University in Atlanta and the Atlanta Veterans Administration Medical Center in Decatur, Ga., took up that question for a study published last month in The Journal of Neuroscience. Their interest was motivated in part by animal research at the V.A. medical center. That work had determined that exercise increases the levels of substances known as growth factors in the animals’ bloodstream and brains. These growth factors, especially one called brain-derived neurotrophic factor, or B.D.N.F., are known to contribute to the health and well-being of neurons and consequently, it is thought, to improvements in brain health and cognition after regular exercise. But the brain is not the only body part to contain neurons, as the researchers behind the new study knew. The retina does as well, and the researchers wondered whether exercise might raise levels of B.D.N.F. there, too, potentially affecting retinal health and vision. To test that possibility, the researchers gathered adult, healthy lab mice. Half of these were allowed to remain sedentary throughout the day, while the other animals began running on little treadmills at a gentle rodent pace for about an hour a day. After two weeks, half of the mice in each group were exposed to a searingly bright light for four hours. The other animals stayed in dimly lit cages. This light exposure is a widely used and accepted means of inducing retinal degeneration in animals. It doesn’t precisely mimic the slowly progressing disease in humans, obviously. But it causes a comparable if time-compressed loss of retinal neurons. The mice then returned to their former routine — running or not exercising — for another two weeks, after which the scientists measured the number of neurons in each animal’s eyes. The unexercised mice exposed to the bright light were experiencing, by then, severe retinal degeneration. Almost 75 percent of the neurons in their retinas that detect light had died. The animals’ vision was failing. But the mice that had exercised before being exposed to the light retained about twice as many functioning retinal neurons as the sedentary animals; in addition, those cells were more responsive to normal light than the surviving retinal neurons in the unexercised mice. Exercise, it seems, had armored the runners’ retinas. Separately, the researchers had other mice run or sit around for two weeks, and then measured levels of B.D.N.F. in their eyes and bloodstreams. The runners had far more. Tellingly, when the scientists injected still other mice with a chemical that blocks the uptake of the growth factor before allowing them to run and exposing them to the bright light, their eyes deteriorated as badly as among sedentary rodents. When the mice could not process B.D.N.F., exercise did not safeguard their eyes. Taken together, these experiments strongly suggest that “exercise protects vision, at least in mice, by increasing B.D.N.F. in the retina,” said Jeffrey Boatright, an associate professor of ophthalmology at Emory University School of Medicine and a co-author of the study. But obviously, mice are not people, so whether exercise can prevent or ameliorate macular degeneration in human eyes is “impossible to know, based on the data we have now,” said Machelle Pardue, a research career scientist at the Atlanta Veterans Administration Medical Center, who is the senior author of the study. She and her colleagues are trying to find ways to determine the impact of exercise on human eyes. But such experiments will take years to return results. Dr. Boatright agreed, adding that eye researchers have been trying for some time to find a way to externally deliver growth factors or drugs to aging eyes, but the available methods typically involve injections into the retina, a process that is complicated, chancy, pricey, and fundamentally objectionable. Researchers at Bionic Vision Australia have produced a prototype of a bionic eye implant that could be ready to start restoring rudimentary vision to blind people as soon as 2014. 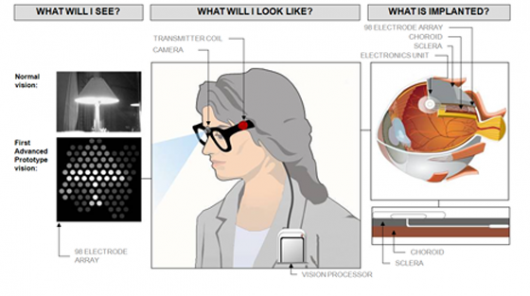 The system consists of a pair of reading glasses with a camera built in, a processor that fits into your pocket, and an ocular implant that sits against the retina at the back of the eye and electronically stimulates the retinal neurons that send visual information to the brain. The resulting image is blocky and low resolution at this point but even in its current form it is going to be a life changer for those with no vision at all. And the future even for sighted people is fascinating. 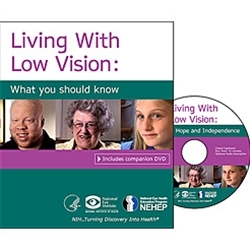 This booklet and companion DVD will help you to better undestand and how to live with low vision. Click on the picture below. Always wear your prescription eyewear and be sure that your glasses are clean. Use sunglasses when appropriate, making sure to avoid frames with wide temple pieces, as they block side vision. Investigate anti-reflective or polarized lens to minimize glare. If you have trouble driving at night because of difficulty seeing, talk to your eyecare professional. Get the big picture when driving. Watch the road ahead and check either side for vehicles, children, animals or hazards. Keep headlights, taillights and windshield (both inside and outside) clean. Explore options like anti-reflective lens coatings, which may allow up to 8 percent more light to enter the eye. Receive eye exams by an eye care professional to ensure that your eyes stay healthy and your prescription remains current. The Argus II?Retinal Prosthesis System includes eyeglasses, a camera, transmitter and video processing unit as well as an implanted artificial retina. The device, the Argus II Retinal Prosthesis System, will be available to patients being treated for late-stage RP, an inherited retinal degenerative disease. Although still a few months away, ophthalmologists at the Vanderbilt Eye Institute are eagerly anticipating the arrival of the innovative technology for patients who are functionally blind. “We are excited to be chosen as one of the centers nationwide to provide this remarkable innovation to our patients,” said Paul Sternberg Jr., M.D., George W. Hale Professor and chair of Ophthalmology and Visual Sciences and director of the Vanderbilt Eye Institute. “It is an acknowledgement that VEI is one of the premier eye institutes in the country. Retinitis pigmentosa is a retinal degenerative disease characterized by progressive peripheral vision loss and night vision difficulties. It is caused by abnormalities of the rods and cones (receptors of vision) that can lead to peripheral and central vision loss. An estimated 100,000 people are living with RP in the U.S.
Anita Agarwal, M.D., associate professor of Ophthalmology, is looking forward to providing an improved quality of life for patients suffering from end-stage RP. Agarwal said researchers have been working toward a treatment for nearly 25 years. And for the past decade, she and her colleagues have been waiting for such a discovery to restore a patient’s ability to perform daily tasks and detect images. Argus II includes a miniature video camera, a transmitter, eyeglasses, a video processing unit (VPU) and an implanted artificial retina. The device works by converting video images captured by the camera, which is mounted on the eyeglasses, into a series of small electrical pulses that are then transmitted wirelessly through the VPU to the implanted retina. The pulses conduct messages to the brain and in turn the patient learns how to interpret the visual patterns. Agarwal stresses that the implanted device will not restore a patient’s vision, rather it will serve as a replacement for the function of the degenerated retinal cells. The device was created by Second Sight Medical Products Inc. In addition to Agarwal, the VEI team, which is made up of physicians, low vision specialists and mobility specialist, includes Milam Brantley, M.D., Stephen Kim, M.D., Jeffrey Sonsino, O.D., Bradley Kehler, O.D., and a vision and a mobility specialist. Those who are visually impaired can now live a more visual life thanks to OrCam, a pocket-sized portable computer that’s connected to a camera, which clips to the person’s glasses with a tiny magnet. Looking similar to Google Glass, OrCam is more powerful and can see what you see understands what info you want via your finger-pointing, relying on auditory feedback through a bone conduction earpiece the users wears. It can recognize faces, read text, identify objects and places and more, making someone who has vision problems live easier. It’s said that OrCam works best when it’s used in moral/daylight, but can function in darker environments with the help of a flashlight. All the user has to do is point their finger so that OrCam can understand the information they need. It will tell them when it sees a face or place that is currently stored in its memory without the person having to do anything else. The device uses an algorithm called Shareboost that makes it “hungry for input,” and can store info in its memory. Although it’s designed for those who are visually impaired, it’s also been proven to work great for those who have memory loss or dyslexia. VANCOUVER, June 25 (Xinhua) -- Rats with low birth weight are most susceptible to developing age-related vision loss compared with their normal-weight counterparts, according to a recently published Canadian study. Additional work needs to be done to see whether the same link exists in people, and if it does, doctors will need to better monitor vision concerns in adults who were born with a low birth weight, the researchers from the University of Alberta said. The study was published in the peer-reviewed journal PLOS One in middle April. The study also found that the rats with low birth weights had poorer night vision. It is normal for night vision to be slightly affected by age, but night vision loss was worse as these lab models aged, according to the researchers. Lead of the study Yves Sauve said: "Most age-related eye diseases fall in the category of complex diseases, meaning that many factors can compound the severity of the risk, and birth weight could be one of those factors." Just as some people with a disability need a wheelchair or a hearing aid, a person with low vision needs extra help beyond what ordinary eyeglasses or contact lenses can provide. "If you have low vision, you should understand that there are no magic glasses," says vision rehabilitation specialist Mary Lou Jackson, MD, of the Harvard School of Medicine affiliate Massachusetts Eye and Ear Infirmary in Boston. Dr. Jackson also is chairperson of the American Academy of Ophthalmology Vision Rehabilitation Committee. Even so, different configurations of magnifiers and video camera magnifiers may at least partially compensate for the part of the visual field where blind spots have caused vision loss. Be aware that one size does not fit all when it comes to low vision devices. Dr. Jackson says that a particular kind of magnifier helpful to someone with peripheral vision loss, for example, might not work at all for someone with central vision loss. So never rush to buy an expensive device for yourself or a family member without doing some checking first. Finding the right low vision device is a very individual choice, depending on specific vision loss and needs. Start your search for the right device by assessing what specific types of low vision magnifiers are available and what each device can — and cannot — do for certain types of vision loss. Decreased visual acuity does not have to lead to the loss of independence. Often simple changes in the home combined with the use of low vision aids and proper organization can allow the person with visual impairment to live as they had been used to living. The following information is presented to serve as a helpful guide and does not address all tasks or difficult situations. If your vision prevents you from performing a certain task, do not assume that it cannot be done. All of the home adaptations should be used in conjunction with the use of low vision glasses, low vision aids and training in the use of the low vision aids. A low vision eye examination performed by an eye doctor who specializes in vision rehabilitation will address all daily tasks that you are having difficulty performing. The doctor will then prescribe low vision aids or products that will help you perform the desired task. The doctor may also prescribe the services of an occupational therapist or vision rehabilitation specialist who can work with you in the home so that you become proficient using low vision aids and glasses and learn to perform all daily tasks. In the interest of electronic video magnification, Optelec has an extensive network of authorized dealers who are able to work with you and help determine which solutions will best meet your low vision needs. The ultimate goal of low vision rehabilitation is to help the client remain independent while performing their desired daily living tasks and hobbies. Increase task illumination. Use gooseneck lamps, illuminated magnifiers and flashlights. An elderly person requires nearly three times as much light as a 20-year-old. A person who is visually impaired may need even more lighting. Decrease glare from lighting, windows and sun as glare can further reduce vision and cause fatigue. Modify the size of the object with either large print versions of the product or with special low vision magnification products and eyeglasses. An eye doctor who specializes in low vision rehabilitation will be able to prescribe the needed glasses or magnifiers that are necessary to perform a certain task. 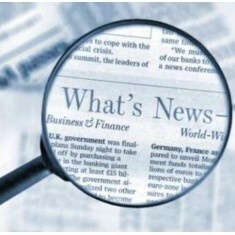 Eye glasses and magnifiers can be made up to 20X power. Electronic low vision aids can provide up to 75X power. Enhance contrast between the object and its surroundings.